Looking for a clear and simple path to a new intranet? Download our free Intranet Buyers Workbook to learn 10 key steps in evaluating intranet solutions. This article is the first (see Mechanistic and organic organizations and What would Donald Schön think of your social intranet?) in what’s becoming a bit of a review of some of the theory shaping the ideas behind social intranets. Let’s continue the discussion in 10 days at Enterprise 2.0 in Boston. One of the best parts of my job is the privilege of having conversations about the emerging field of social software, Enterprise 2.0, Social Business, the latest generation of Knowledge Management (or whatever you prefer to label the collection of people busy innovating away at the moment in this area) with some truly brilliant minds and kindred spirits. One such chat that I recall vividly happened with Thomas Vander Wal, the first time we met in person in Washington DC in December 2009. I was there for a proposal shortlist presentation and dropped him a note to ask if he’d be interested in having coffee. He obliged and what was scheduled for a 30 min chat wound up turning into a close to 4 hour conversation at a local coffee shop. We rambled far and wide on topics, shared our common interests and backgrounds, and I reluctantly left Thomas to the remainder of his afternoon, my head spinning with all sorts of great thoughts. If you’ve had the pleasure of meeting Thomas in person or attending one of his presentations at a conference in the past few years, you may very well have had a similar experience. He’s just that kind of guy: full of ideas and in possession of a remarkable memory that allows him to reference and recall a great wealth of material in the midst of a discussion. And a great desire and willingness to share those ideas. It was for this very reason that I had a big grin on my face when I read the opening dedication of Dave Gray’s February blog post, The Connected Company to Thomas as the inspiration for Dave’ s post. I too would like to thank Thomas for his inspiration and role in this post, which I hope does our conversations some justice. I renewed our discussions in-person at KM World 2010 in DC again last November. It was all too brief, but I have more great memories, in particular Thomas and I huddled around Dave Snowden’s laptop, along with Jon Husband, Bill Ives, while Thierry Hubert gave a demo of their Darwin system. KM World 2010, which clearly had an impact on Thomas, further solidified some of the thoughts that I’ll try my best to articulate below, in large part thanks to previous chats with Thomas, Jon, Euan Semple, Stewart Mader, James Robertson, Lee Bryant, and listening to Dave Snowden’s keynote in DC. So enough pre-amble. This is a long overdue blog post on my part. Probably 5 years overdue. But sometimes it takes a while to get that long hunch to fully develop. One of Dave’s core messages in his post is that the metaphor which we use to guide our thinking about companies, the metaphor of the machine, is well… broken. Or rather, it wasn’t ever applicable in the first place. Companies aren’t machines, they are systems. 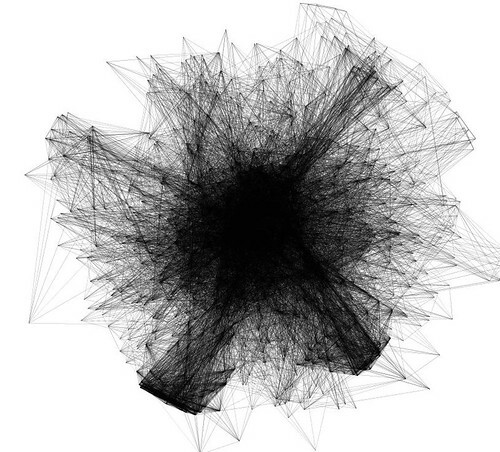 Complex systems. “It’s time to think about what companies really are, and to design with that in mind. Companies are not so much machines as complex, dynamic, growing systems. As they get larger, acquiring smaller companies, entering into joint ventures and partnerships, and expanding overseas, they become “systems of systems” that rival nation-states in scale and reach. “So what happens if we rethink the modern company, if we stop thinking of it as a machine and start thinking of it as a complex, growing system? What happens if we think of it less like a machine and more like an organism? Or even better, what if we compared the company with other large, complex human systems, like, for example, the city?” – From Dave’s Connected Company post. The idea of companies as complex systems is still relatively new to many people in the business world, even though the thinking behind complexity theory has been studied and discussed for nearly three decades. “Chaos Theory”, as it was popularized by science writer James Gleick, and the work of the Sante Fe Institute dates back to the 1980’s, as a multi-disciplinary intellectual endeavour to understand the non-linearity and puzzling behaviours of complex systems, which could not be described by simple cause and effect relations. Many people in the business world describe systems as being complex, while not being fully aware of the nature, dynamics, and attributes of complex systems as formally defined by the field of complexity science. I believe a quick review of those attributes is in order to help those new to the concept. In particular, the description of a particular class of complex systems which under certain conditions can be referred to as complex adaptive systems. Planning professors Judith Innes and David Booher (more on them later) offer this very useful 5-part description in their latest book Planning with Complexity, building a definition from the work of other complexity theorists Paul Cillers, Ralph Stacey, and Hari Tsoukas. Interactions The agents interact dynamically, exchanging information and energy based upon heuristics that organize the interactions locally. Even if specific agents only interact with a few others, the effects propagate through the system. As a result, the system has a memory that is not located at a specific place, but it is distributed throughout the system. Nonlinearity The interactions are nonlinear, iterative, recursive, and self-referential. There are many direct and indirect feedback loops. System behaviour The system is open, the behaviour of the system is determined by the interactions, not the components, and the behaviour of the system cannot be understood by looking at the components. It can only be understood by looking at the interactions. Coherent and novel patterns of order emerge. Robustness and adaptation The system displays both the capacity to maintain its viability and the capacity to evolve. With sufficient diversity the heuristics will evolve, the agents will adapt to each other, and the system can reorganize its internal structure without the intervention of an outside agent. I love this table. I think it’s one of the most clearly written overviews of CAS that I’ve been exposed to. I only have one point of contention with the description and that’s the use of the “robustness” as a feature – instead the term “resilience” has much more ecological connotations, describing a system able to absorb energy, withstand shocks, and bounce back. Sanjay Khanna introduced me to the importance of the concept of resilience a few years ago (albeit in a different but entirely related context) and more recently resilience took centre stage in Dave Snowden’s closing keynote at KM World 2010, entitled “The Resilient Organization.” For Dave Snowden, robustness is a mechanical / engineering property of complicated systems, not adaptive, resilient complex systems. Dave Snowden, like Dave Gray, is clear in his message: the mechanical / engineering metaphors that sought robustness, predicated on a systems dynamics approach to problem solving and decision making, are nearing the end of their utility. That is not to say we haven’t accomplished great things under this paradigm, or that we didn’t accomplish great things in the scientific management era that preceded it. [Note: I’m typing this essay on my laptop right now, in the midst of a cross country flight, hurtling through the sky, all thanks to the wonders of the mechanical age.] It is to say that how things were done then, might not be how things should be done now, given the degree of complexity that organizations face in today’s world. And arguably, if the 400+ year old companies Dave Gray mentions, further detailed in The Living Company by Arie de Geus, have anything to show us, it is that those designed to handle complexity from the start have had a long-term adaptive advantage that others have not. And who are those individuals so bold as to attempt to design such monuments to our collective aspirations? Well, as Gray and Buchanan point out, these people are urban planners. Of course, planners don’t design cities quite the same way a designer designs a material object. Dave’s description of the type of design is a clever turn of phrase; it’s the difference between designing for control vs. designing for emergence. If the emergence of a system-wide, higher order of functioning is the beneficial outcome of a productive, adaptive, and resilient complex adaptive system, who is there attempting to nudge it into this higher state? I live in Vancouver, which as of this year turns 125 years old and is considered by many to be a remarkable urban experiment in ethnic diversity, urban density, and planning. We’re a young city, far younger than those 400+ year old companies mentioned earlier. And we’re still a work in progress, one which gets a fair bit of attention from planners across North America and around the world who are struggling with their own highly complex civic realities. Cities, urbanism, and planning have been an interest of mine for a while now, dating back to university, and it’s been further amplified and enhanced by the fact that I’m married to a brilliant, wonderful woman who happens to be a planner. Along with her stunning intellect and personality, I also get to enjoy a wonderful collection of books that came along with her (bonus! ): texts on urban planning, transportation, the dynamics of cities, and the philosophy of planning (Yes dear, I do love you for more than your books. Really.). And while I’m not the one with the graduate degree in planning in the house, I have done a bit of reading on the topic. My initial findings: many urban planners in North America during the 20th century have been under the influence of the same metaphors as corporate organizational designers and systems engineers: a seemingly logical, rational, positivist tradition that assumes linear, cause-and-effect, machine-like systems. While not mentioned directly in his post, Dave Gray’s version of a new corporate urbanism for company design is a whole lot more Jane Jacobs than it is Robert Moses. The end of Dave’s essay, which talks about the importance of “the street”, is all Jacobs, all the time. Jacobs too, as Steven Johnson highlighted in his books on complex adaptive systems and emergence [Emergence, Where Good Ideas Come From], was a fan of the messy coherence of the complex city. No Corbusier here, thanks. So that brings me to why this essay appears on the ThoughtFarmer blog. We were in a meeting the other day at work and I tried to quickly summarize to a partner we’re working with that social intranet software like ours is in fact a complex adaptive system affording the behaviour and interactions of larger complex adaptive systems (the company). I got some blank stares (hopefully this blog post makes that better). The social intranet is a system that comprises a large number of agents (employees of a company) connected through multiple networks. In this case, to dispel any confusion, I’d describe a network in a Social Network Analysis fashion as a group of individuals connected to each other through their interactions, not a physical network / technology / “hubs and routers” fashion. If there was ever a problem that the social intranet was attempting to solve, I think that’s it. A social intranet allows you to access your organization’s collective, distributed memory in order to sense make, recognize patterns, and make decisions. Nonlinear? Check. Iterative? Check. Recursive, self referential? Check. Feedback loops? Yes please. How do we understand the intranet’s (and therefore a subsystem of the larger company’s) behaviour? We have to look at the performance of the system as a whole. What did John Hagel attempt to do at Deloitte earlier this year? Look at the overall system’s performance — he moved away from a reductionist model. And good for Socialtext and Traction for getting clients brave enough to participate. Coherent and novel patterns emerge? Our first deployment of ThoughtFarmer in 2006, chronicled in Andrew McAfee’s Enterprise 2.0 book, had a great moment in it, a few weeks into the launch. We had what Duncan Watts would describe as an information cascade. We thought the beginning of the intranet might be the end thanks to the nature of the cascade, but luckily the organizational culture that led to the creation of ThoughtFarmer in the first place was accepting enough to realize that was just as emergent as all the good stuff they were hoping for but didn’t know would come. The cascade happened as follows: one user changed his profile picture to be Tom Selleck, Magnum PI era. This, at the time of ThoughtFarmer 1.0, showed up in the activity stream on the homepage. Another user saw that, changed their picture to be Higgins (the PI’s butler). And then someone else changed theirs to be another 80’s TV icon. And another, and another, and so on. Before day end, most of the company looked like Threes Company, the A-Team, or Dallas. It was clear that this intranet was not a static information environment. It was made of people, just as much as it was pages. Finally, does the intranet display both the capacity to maintain its viability and the capacity to evolve? We think so. 4 years in from the launch of our product, we’ve watched organizations closely with their use of this adaptive and flexible tool. Re-organization of the design firm Continuum was facilitated through the use of ThoughtFarmer. This strikes me as the ultimate adaptive act of any organization; redesigning or re-organizing its structure from the inside. Of course, I can’t finish this post without pointing out that many others had made the link between complex adaptive systems and the types of environments that social software affords. One of the most influential articles that I read was written when distributed, many-to-many intranets were non-existent. Dave Snowden’s Intranet as Complex Ecology written in 2001 is as relevant today in terms of its design implications as it was 10 years ago. Peter Morville and Lou Rosenfeld sensed the act of information architecture not to be a static endeavour but a dynamic one (and continue to do so) back with the publishing of the Polar Bear book, one that has had a lasting impact for many and defined an emerging profession in many ways. And Josh Porter called it like it is in 2008 in his book Designing for the Social Web, building on the work of Tom Coates, Jyri Engstrom‘s, Stewart Butterfield and other Web 2.0 pioneers. They clearly understood (and continue to do so) the power of emergence and the dynamics of these systems. We owe them a lot in defining some of the fundamental social interaction design patterns that we now take for granted, which 7 years ago were experimental and novel themselves. Finally, some important writing continues to stream from long time contributors and practitioners. Just in the last two months, I’ve seen great posts from JP Rangaswami, Geoffrey Moore, Luis Suarez, and of course, Thomas Vander Wal, further contributing to our understanding of just what the hell it is we’re doing. 2011 is off to an exciting start in the field of social software, social business, and all things complex and adaptive. I hope that now the floodgates have broken on my blogging, I’ll be able to continue writing more about this topic and re-engage in the conversations that started this whole thing. In particular, if we do believe that urban planning as a discipline holds some answers for approaches to how we tackle the design of complex adaptive systems, we (social software professionals, the readers of this blog and Dave’s blog) need to better understand the current state of planning, its historical roots, and some recent philosophical shifts occurring in that field. As Innes and Booher point out, it’s not all roses and sounds a lot more familiar than we might have expected when looking for inspiration in other domains.